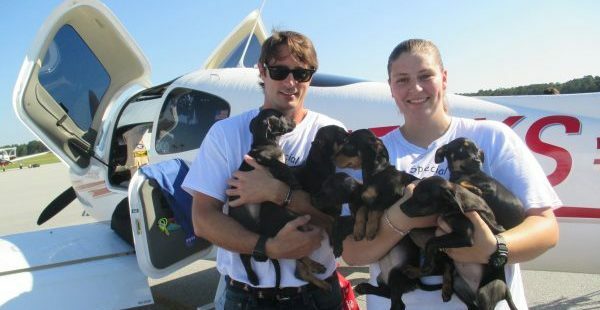 SAVANNAH, Ga. – On Saturday, July 23, Animal Aid USA co-founders Lorenzo Borghese and Karen Talbot will be clearing the shelters in Liberty, Pierce, Long, Murray and Laurens County in honor of the nationwide pet adoption event, Clear the Shelters Day. While this nationwide adoption initiative takes place annually to save the lives of homeless animals, Animal Aid USA has a clear the shelters day each month, rescuing approximately 250 dogs per trip from high-kill shelters in the south. The team provides all medical assistance needed, and then transports the rescued canines to their adoption partners across the U.S. where they have a chance to live out their lives in a forever home. Animal Aid USA has saved over 14,000 dogs since it was founded in 2012, and this Saturday the group plans to rescue over 330 more. “Once you look into the eyes of these animals, you wouldn’t be human if you didn’t cry for them and what they’ve gone through,” states Meredith Vieira, who joined Animal Aid USA in a monthly transport. In addition to monthly caravans, Animal Aid USA also offers free spay and neuter services to low income communities, and an animal awareness program that focuses on teaching children the importance of pet adoption. Animal Aid USA is an all-volunteer nonprofit organization providing education, awareness and resources to the public in an effort to empower positive change for shelter animals. Through monthly transports from high kill shelters to qualified rescues across the U.S., to its spay/neuter clinic providing free sterilization to low income communities, Animal Aid USA strives to improve the lives of homeless animals nationwide. IF a mother dog is found or being surrendered with the pups, we ABSOLUTELY take the mom. NO mom is left behind! For the moms that the owner will NOT surrender- we PAY FOR AND SPONSOR the spay so mom doesn’t ever have to reproduce again! IF mom is chained , WE provide a kennel for the mom with a topper, pavers and ANYTHING else necessary for the dog! We solve MANY problems. EVERY animal we bring into our program IS spayed and neutered and will NEVER reproduce when they grow up! Where’s the mother dogs??? You don’t solve the problem of unwanted animals unless you take the mother dog, get her spayed and then adopted with her pups (who also should be fixed before adoption).